What causes a knee injury? What are risk factors for a knee injury? What specialists treat knee injuries? How do health care professionals diagnose a knee injury? What are home remedies for a knee injury? What is the medical treatment for a knee injury? What exercises are recommended, and what exercises should be avoided during rehabilitation for a knee injury? What is the recovery time for a knee injury? What is the prognosis of a knee injury? What are complications of knee injuries? Types of common knee injuries include sprains, strains, bursitis, dislocations, fractures, meniscus tears, and overuse injuries. Knee injuries are generally caused by twisting or bending force applied to the knee, or a direct blow, such as from sports, falls, or accidents. Risk factors for knee injury include overuse, improper training, having osteoporosis, and playing high-impact sports that involve sudden changes in direction. The main signs and symptoms of knee injury are knee pain and swelling. Knee injuries are diagnosed by a history and physical examination. Sometimes an X-ray or MRI may be done. Treatment of knee injuries depends on the type and severity of the injury and can involve RICE therapy (rest, ice, compression, elevation), physical therapy, immobilization, or surgery. Prognosis for knee injury depends on the type and severity of the injury and the need for physical therapy or surgery. Prevention of knee pain and injuries involves proper training, proper equipment, and maintaining a safe playing field or home environment to avoid falls. With an acute injury, the patient often describes that they heard a loud pop and then developed intense pain in the knee. The pain makes walking or weight-bearing very difficult. The knee joint will begin to swell within a few hours because of bleeding within the joint, making it difficult to straighten the knee. If left untreated, the knee will feel unstable and the patient may complain of recurrent pain and swelling and giving way, especially when walking on uneven ground or climbing up or down steps. The knee is one of the most commonly injured parts of the body. Sports, falls, and motor-vehicle accidents account for the vast majority of knee pain and injuries to the knee. The different types of common knee injuries to the knee are defined by the affected anatomy of the knee and the mechanism by which it's injured. Knee sprains are injuries to the ligaments that hold the knee together. There are multiple ligaments that stabilize the knee and keep it in alignment. The anterior cruciate ligament (ACL) and the posterior cruciate ligament (PCL) stabilize the knee in movement from front to back and cross each other in the middle of the knee joint. The medial collateral ligament (MCL) and lateral collateral ligament (LCL) stabilize the knee so that the bones do not slide from side to side. Grade 1 knee sprain: The ligament is stretched and painful, but fibers are not torn and no instability is present. Grade 2 knee sprain: The ligament fibers are torn partially, mild instability may be evident. Grade 3 knee sprain: The ligament fibers are completely torn and the knee is unstable. Knee strains occur when tendons or muscles surrounding the knee are stretched, usually due to hyperflexion or hyperextension of the knee. These strains can lead to pain outside of the knee joint but can cause dysfunction of the normal range of motion of the knee. The patellar tendon stretches from the lower kneecap to the front of the tibia bone at the front of the leg. Knee bursitis occurs when a fluid-filled pouch (called a bursa) in the knee is irritated, inflamed, or infected. Bursas are fluid-filled sacs located around joints that act as shock absorbers that minimize the friction between various tissues, such as the muscles and tendons around the joints. In the knee, there are two main bursas, one above the kneecap (patella), and one below the knee joint near the front of the tibia bone. Tears of the meniscus can occur from damage to the inside of the knee. The medial and lateral menisci (plural of meniscus) are semi-round, articular cartilage that act as shock absorbers and smooth cushions for the thighbone (femur). These menisci can be injured acutely or can become dysfunctional gradually due to overuse and/or aging. Knee joint dislocation can occur due to high-impact, large-force injuries to the knee (sports, motor vehicle accidents). This is a rare injury but causes severe damage to all the anatomical components of the knee and can include damage to the blood vessels and nerves about the knee. This requires emergency treatment or surgery. The kneecap (patella) can dislocate to the side of the knee. Patellar dislocation can be very painful but is generally not life-threatening and can be treated by popping it back into place (reduction of the patella), splinting, and physical therapy. Knee fractures occur from direct blows to the bones. Patella, or kneecap, fractures occur when a person falls directly down onto the knees and the kneecap cracks due to the force. Collapse of the top of the tibia bone in the knee (tibia plateau fracture) can occur from sudden compression injury to the knee, especially in people with osteoporosis. 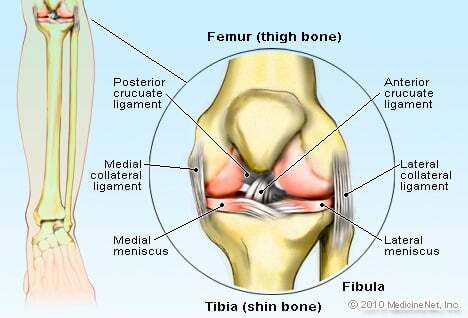 Other fractures of the long bones (fibula, tibia, and femur) are rare with isolated injures to the knee. Other overuse injuries of the knee include patellofemoral pain syndrome (often referred to as "runner's knee," which causes pain on the front of the knee) and weakness and degeneration of the cartilage under the kneecap (chondromalacia patella). These injuries are due to an accumulation of repetitive damage to the knee structures. Congenital knee problems or improper mechanics of the knee movement may cause this. Osteochondritis dissecans is a joint disorder that occurs most commonly in children. Bone and cartilage beneath the joints loses its blood supply, resulting in joint pain and stiffness. This condition typically affects the knees, but it can also affect other joints such as elbows and ankles. Osgood-Schlatter disease is a condition in children caused by growth spurts that cause knee pain and swelling below the kneecap. Most knee injuries are caused by an external force bending or twisting the knee in a manner that it was not anatomically designed for. Common causes of knee injuries are from a twisting mechanism from falls, sports, or accidents. A twisted knee can cause damage to the ligaments and cartilage. High-force injuries such as sports-related injuries and motor vehicle accidents can disrupt multiple parts of the knee anatomy, causing multiple types of knee injuries. Bursitis can be caused by overuse, arthritis, degenerative joint disease, injuries from kneeling, infection, or gout. High-impact sports, including running, basketball, football, hockey, soccer, cycling, and others, can increase the risk of knee pain and injury. Sports where shoes with cleats are worn and sharp, sudden changes in direction are made, along with contact sports, are common risks for knee injury. Exercise, such as high-impact cardiovascular activity or yoga, can also cause knee injury. The elderly may be at higher risk for knee injury due to falls and osteoporosis. Women may be at higher risk for anterior cruciate ligament injuries (ACL) and patellar injuries. This is due to the anatomy of a woman's hips and femur and the angle at which the knee is tilted. This can lead to chondromalacia patella (CMP), an inflammation or irritation of the underside of the patella. Being overweight can be a risk factor for knee injury, as excess weight puts more stress on the lower extremity joints. Overuse and overtraining, improper or insufficient training for a sport, or not properly rehabilitating acute injuries can also predispose a person to knee injuries. The symptoms and signs of knee injury are related to the type of injury and the part of the knee that was injured. If the injury is acute, the main symptoms will most likely be knee pain and swelling. If the injury is chronic or from overuse, the symptoms of clicking, popping, and intermittent pain will be more prominent. A knee injury may first be examined and treated by a primary care provider (PCP), such as a family practitioner, an internist, or a child's pediatrician. If you go to the emergency room for your knee injury, you will be seen by an emergency medicine specialist. If the knee injury is severe, you may be referred to an orthopedist (a specialist in injuries of the musculoskeletal system) or an orthopedic surgeon. If your knee injury is related to sports, you may see a sports medicine specialist. Other medical professionals who may be involved in treating your injured knee include physical therapists, occupational therapists, or other rehabilitation specialists. The diagnosis of a knee injury is made by a physician on the basis of history, physical examination, and sometimes the use of X-rays or MRIs. Depending on the how the knee was injured and whether or not there are accompanying medical issues, the doctor will perform specific tests involving bending or twisting the knee to test the stability of the ligaments and check for damage to the cartilage. Knee-bending tests done by your doctor are designed to isolate specifically which ligament or part of the cartilage has been damaged. Further testing with X-rays, CT scans, or MRIs may be necessary to evaluate the extent of the injury and help determine treatment and prognosis. X-rays and CT scans are used to asses for bony injuries (fractures), and MRIs are used to evaluate soft-tissue damage (ligaments and cartilage). Treatment for a knee injury depends on the part of the knee that is damaged and the extent of the damage. Some injuries such as simple strains or sprains are treated with home remedies such as RICE therapy (rest, ice, compression, and elevation). Taking time off from sports and exercise may be enough for minor injuries and knee pain to heal. Over-the-counter nonsteroidal anti-inflammatories (NSAIDs) such as ibuprofen (Advil, Motrin) or naproxen (Aleve) may help treat the pain and inflammation from these minor injuries. Chronic knee injuries may respond to heat therapy. More serious knee injuries require medical care. Knee immobilization or splinting keeps the knee from moving and decreases the chance of further injury. Immobilizing the knee can help stabilize an injured knee that may not be stable due to torn ligaments. It also keeps the knee from moving to assist in resting the knee. Chronic knee injuries involving inflammation and bursitis may be treated with anti-inflammatories. Injections of cortisone (a steroid with powerful anti-inflammatory effects) may be helpful in these situations. More extensive injuries involving torn ligaments, instability of the knee joint, swelling, decreased range of motion, or fractures will require an orthopedic surgeon consultation. In the initial stages of these more extensive injuries, RICE therapy can still be used. Staying off the leg by using crutches or a wheelchair may be advised. Surgery may be indicated for tears of the ligaments or extensive meniscal tears. Surgery may also be needed for fractures or dislocations of the knee. Some acute injuries such as those with high-force impact, or multiple parts of the knee damaged, may require emergency surgery. Most knee surgery can be done by arthroscopy, a procedure in which a camera is used and small punctures are made in the knee to insert instruments. Repairs can be done inside the knee without having the open the knee with a large incision. Most arthroscopic surgeries do not need to be done immediately after an acute injury. Some are delayed to allow for decreased inflammation. After surgery, or if surgery is not an option, physical therapy can be used to strengthen and stretch the muscles surrounding the knee. Physical therapy can also allow for better movement mechanics of the leg and the knee to help prevent future injury. During physical therapy for rehabilitation of a knee injury, the patient will be given specific exercises by the physical therapist in order to strengthen and stabilize the knee joint. These exercises include strengthening the front of the thigh (quadriceps), back of the thigh (hamstrings), calf, and hip. Consult your doctor and your physical therapist before starting any exercise program. Your physical therapist should insure you perform the exercises properly before doing them on your own. If you have any pain or discomfort while doing prescribed exercises, see your doctor or physical therapist. The American Academy of Orthopedic Surgeons (AAOS) has an exercise guide that includes directions and pictures. Consult your doctor or physical therapist before trying any of these exercises on your own. These exercises can further stress already damaged knee joints. The recovery time for a knee injury depends on the type and severity of the injury. If the injury is significant enough to require surgery and/or physical therapy, the recovery time will be longer. Simple strains or sprains can last for one to two weeks. More extensive injuries requiring arthroscopic surgery may take one to three months to heal. Major traumatic injuries to the knee may take up to a year to heal. Following the doctor's instructions for rest, immobilization, staying off your feet, and avoiding exercise that aggravates the injuries will help speed recovery. Physical therapy can also speed recovery time. It is important to follow directions of your physical therapist to insure you are doing the exercises correctly and attaining the best results. Chronic knee injuries that do not require surgery may flare up from time to time. Physical therapy, anti-inflammatory medications, and cortisone injections are used to provide temporary relief. The prognosis of a knee injury depends on the type and severity of the injury. Most minor knee injuries (strains, minor sprains) heal on their own with conservative treatment. The prognosis for these types of injures is good. Ligament or cartilage injuries that lead to dysfunction or instability of the knee may require surgery. These injuries generally respond well to surgery and patients can ultimately gain full or nearly full range of knee motion. Knee injuries are rarely life-threatening, though severe injuries may be disabling. Some knee injuries lead to chronic, irreversible damage to the knee and may result in complications such as long-term dysfunction. Knee-joint dislocations can cause blood vessel injuries and can lead to severe disability. For specific information on prevention of anterior cruciate ligament (ACL) injury, check out the ACL Prevention Project training program by the Santa Monica Orthopaedic and Sports Medicine Foundation. It is a 15-minute training session that consists of a warm-up, stretching, strengthening, plyometrics, and sport specific agility training. American Academy of Orthopaedic Surgeons. "Common Knee Injuries." Mar. 2014. <https://orthoinfo.aaos.org/en/diseases--conditions/common-knee-injuries/>. American Academy of Orthopaedic Surgeons. "Knee Arthroscopy Exercise Guide." Feb. 2017. <http://orthoinfo.aaos.org/topic.cfm?topic=a00300>. American Academy of Orthopaedic Surgeons. "Osgood-Schlatter Disease (Knee Pain)." May 2015. <https://orthoinfo.aaos.org/en/diseases--conditions/osgood-schlatter-disease-knee-pain/>. American Academy of Orthopaedic Surgeons. "Osteochondritis Dissecans." Mar. 2015. <https://orthoinfo.aaos.org/en/diseases--conditions/osteochondritis-dissecans/>. Felson, Sabrina. "Knee Ligament Injuries: PCL, LCL, MCL, and ACL Injury." Nov. 16, 2016. <https://www.webmd.com/fitness-exercise/guide/knee-ligament-injuries?page=2>. Juhn, Mark S. "Patellofemoral Pain Syndrome: A Review and Guidelines for Treatment." Am Fam Physician 60.7 Nov. 1, 1999: 2012-2018. <http://www.aafp.org/afp/1999/1101/p2012.html>. Murphy, D.F., D.A.J. Connolly, and B.D. Beynnon. "Risk Factors for Lower Extremity Injury: A Review of the Literature." Br J Sports Med 37 (2003): 13-29. <http://bjsm.bmj.com/content/37/1/13.full>. Santa Monica Sports Medicine Foundation. "Pep Program." <http://smsmf.org/smsf-programs/pep-program>. Describe what happened and how it felt when you had a meniscus tear. What was the treatment or medication you received for your meniscus tear? Describe the healing and recovery process for your meniscus tear. In what ways would you try to prevent a meniscus tear? What caused your knee injury? Please describe your experience with your knee injury. Chondromalacia patella (housemaid's knee or secretary's knee) results from misalignment of the kneecap as it slides over the lower end of the thigh bone. Symptoms include tightness or fullness in the knee area, swelling, and mild discomfort. Treatment includes the use of anti-inflammatory medications, in addition to stretching, strengthening and icing the knee. A torn meniscus (knee cartilage) may be caused by suddenly stopping, sharply twisting, or deep squatting or kneeling when lifting heavy weight. Symptoms of a meniscal tear include pain with running or walking long distances, popping when climbing stairs, a giving way sensation, locking, or swelling. Treatment depends upon the severity, location, and underlying disease of the knee joint. The knee is a joint where the bone of the thigh (femur) meets the shinbone of the leg (tibia). See a picture of Torn Meniscus and learn more about the health topic.